Here is my review of the book Mechanisms and Mechanical Devices Sourcebook, 4th Edition by Nicholas Chironis and Neil Sclater. Though I like my 4-volume set Ingenious Mechanisms for Designers and Inventors, I like this book even better. I am man enough to admit that I fell deeply in love with this book the moment I opened it in a bookstore one day. I resisted buying it, but not for long. My interest in mechanical devices does not typically involve elaborate multi-stage industrial machines. 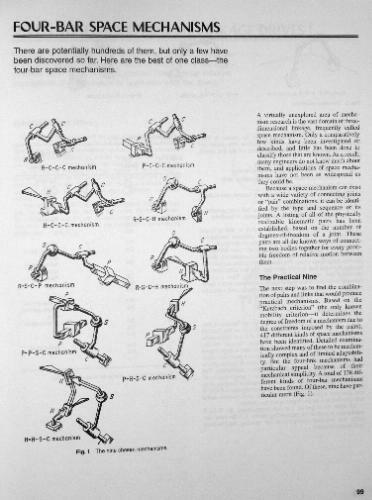 Rather, in the course of building an automaton I will come upon a design challenge that is limited in scope: How do I convert this motion into that motion? I wonder how one might use a gear here? There are typically any number of potential solutions. This book gives you a great reference tool to explore your options. I find that by browsing this book, my brain is jogged into finding a solution, even if it does not come directly from the book. I'm one of those visual learners. This book is ideal for me. The text in this book accompanies a very nice graphic or two. It's concise; that means I'll actually read it rather than just skim over it. The images in this book use a combination of line art and greyscale tones. This subtle difference really makes the images easier to decipher. This book is really, really, good. I know it's a little pricey, but it is pretty cheap as engineering textbooks go. In addition to the stately hardcover, Mechanisms and Mechanical Devices Sourcebook is also available for you Kindle at a greatly reduced price. I encourage you to order a hardbound copy of Mechanisms and Mechanical Devices Sourcebook, Fourth Editionat Amazon.com. Laikingland featured in Crafts Magazine!